If you’ve got a miniature human in your life you will probably know who Peppa Pig is. For those without a toddler wobbling around the house, Peppa Pig is the star of her eponymous animated series which has become a worldwide hit. 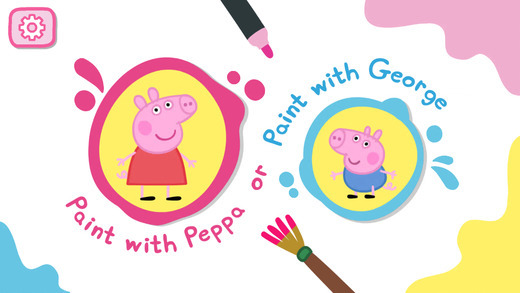 And now Peppa and her brother George are on your iPhone too, with Peppa’s Paintbox by Entertainment One. As far as art packages go, this one is quite basic – you’re given the tools to create cheerful drawings, but your control over these tools is limited. Standard features like adjustable brush sizes and a color wheel are nowhere to be seen. 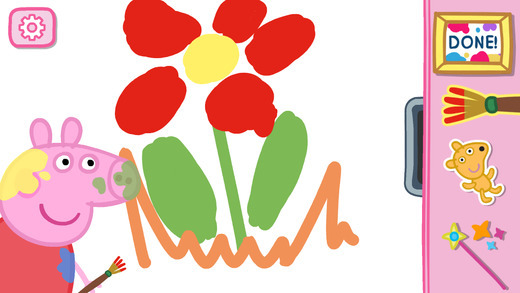 In their place you get lively sticker sets, outline templates to color in, paint splats, muddy puddles and other Peppa Pig-flavored goodies. 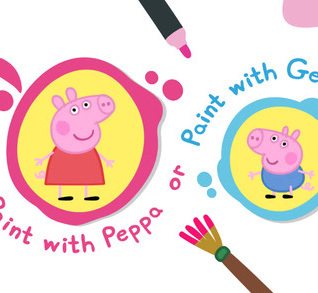 Peppa’s Paintbox is obviously aimed directly at the youngest end of the market, we’re talking about anyone old enough to poke a screen with a podgy little finger, but that doesn’t mean the developer has taken shortcuts. Production values here are fantastic throughout, from the bouncy sound effects to the endearing illustration style. It’s clear that this is an officially licensed product, not a second-rate knockoff. The designers have done a great job of making the drawing process as simple as possible for younger users, with vibrant colors and eye-catching icons for the various tools. The touch interface is perfectly suited to this sort of thing, especially in this instance since pinpoint accuracy isn’t essential. Instead, children can swipe sloshes of bright paint across the screen and then gleefully decorate the screen with bubbles, balloons and cartoon characters with ease. 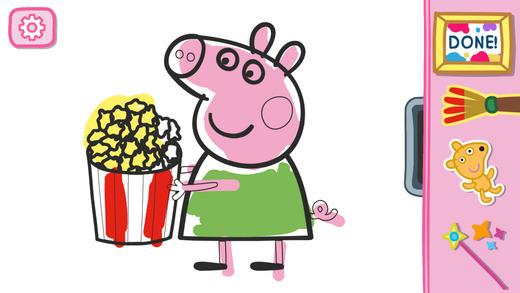 Coloring in the pre-drawn outline images of Peppa and George, or drawing over one of the colorful background settings yields the most satisfying results, sure to have Peppa Pig’s adoring audience smiling from ear to ear. Completed drawings can be saved to your phone’s photo library to share as you please, or perhaps to print and stick on the fridge for display. The only shortcomings with Peppa’s Paintbox are things that the target audience probably won’t even notice. It would be great to have a little more control over brushes and colors, and perhaps a quick-erase or “undo” option, and for older users things quickly become repetitive, but youngsters will probably be enthralled with this app just the way it is. Dripping with bright, happy enthusiasm and charm, this wonderfully polished art app is sure to entertain any Peppa Pig fan with a creative streak. Requires iOS 4.3 or later. Compatible with iPhone, iPad, and iPod touch. This app is optimized for iPhone 5. This app is not compatible with the first generation iPad.